next April 1, 2015 5:01 p.m.
What Will It Take to Make Composting As Routine As Recycling? "Organics recycling" is the next big frontier in how we deal with our garbage. Most of what we throw out is made of organic materials, and, increasingly, those millions of tons of yard trimmings and food waste are going somewhere other than a landfill. There are almost 5,000 composting operations in the U.S. now, and that number is only growing. America is at the beginning of what could be a revolution in how we deal with waste — a compost boom. Many of these operations are still relatively small, but big waste management companies and city sanitation departments are starting their own composting programs, too. It's similar to how farmers' markets pushed big grocery stores to start stocking more local, organic food — community composting has become popular enough that the idea is starting to go mainstream. "We don't want it to be a fringe and niche market," says Darby Hoover, a senior resources specialist at Natural Resources Defense Council. "Because of the nature of composting, you could have the waste management companies doing it and not close out the little guys." 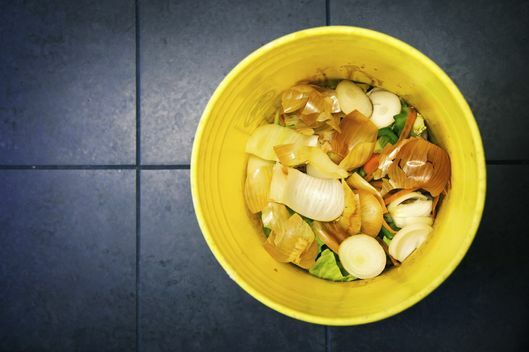 No matter who's doing the actual composting, though, for most people, the idea of separating out food scraps and dealing with them is still unpleasant. But there's a precedent for teaching people to manage their household waste in a different way: it took years, but environmental advocates eventually convinced the majority of American to separate out their paper, plastics, glass and metals for recycling. What will it take to make composting as routine? Convenience. Up until recently, composting meant processing your own squishy, gross, rotting vegetable peels or hauling them to a nearby farmers' market or community garden. But more and more, other people are willing to deal with them for you. In Austin, for instance, Dustin Fedako's Compost Pedallers has collectors on bikes doing pickup from almost 600 households and bringing the food scraps to local farms, churches, and community gardens. New York's running an "organics collection" pilot project that covers more than 100,000 households, and other cities are planning their own "organics recycling" programs. Big waste companies are also getting into the game — whether it's a guy on a bike or a traditional garbage collector, soon someone else will be dealing with the transport. Kitchen design. With more cities requiring composting, kitchen appliances will be better equipped to handle food waste. GE's "Home 2025," for instance, envisions a food disposal gadget that creates compressed "pellets" of food scraps that can be more easily dealt with than a handful of watery carrot peels. Simpler rules. Right now, composting requires a compendium of knowledge about what is and isn't appropriate. Can meat go into the bin? Oils? What about tea bags, paper plates, and disposable plastic forks designed to be biodegradable? One big lesson from recycling is that the simpler you make the rules for what can go into a bin, the more people will throw into it. Even at large operations, composting technology isn't quite at the point that it can deal with whatever's thrown at it: New York's pilot program in schools, for instance, ran into issues because the food waste it was sending its composting facility contained too much actual garbage. But these systems are getting better. Biodegradable utensils, for instance, have been a stumbling block for big composting operations, mainly because they don't always work like they're supposed to. But composters are getting smarter about them. One of the main facilities in Seattle tested out which "compostable" forks actually broke down in its system: Now its partners — which include the Seattle Mariners arena — can simply stock the utensils they know will actually disintegrate. The ultimate goal is to make composting a meal as simple as landfilling it: Anything that's not metal or glass can just go in one bin. Speed. There is one big problem with gathering organic waste together and waiting for it to decompose: It tends to create or attract what the industry calls "vectors" — smells and pests (which include rats, flies, and raccoons). But often even small, local operations are able to deal with large quantities of compost in record time. Compost Pedallers, for instance, has used techniques developed by larger operations to speed up composting at a community scale. Instead of the old-school technique of manually mixing together older and newer layers of compost, their sites use "forced aeration" — punctured PVC piping with air blowing through it — to keep the decomposition process working. According to Fedako, it reduces the time it takes to process a load by a quarter — and requires much less work. With these advances in place, it'll be even easier for cities to start asking — even requiring — people to compost. Emptying out the compost bin might not be the most glamorous part of the future, but it'll definitely be on the chore list.